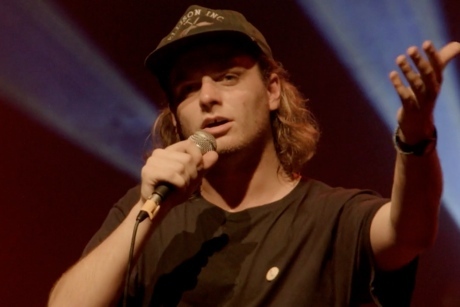 Mac DeMarco's latest Vancouver gig was a triumphant homecoming for the former local resident, since he sold out the spacious Vogue Theatre. Now, some highlights from that energetic set have been released as the latest episode of the Exclaim! co-presented live video series Coastal Frequencies. In the clip, we see DeMarco perform "Rock and Roll Night Club," "Brother" and a beefed-up rendition of his love serenade "Still Together." These performances are intercut with interview footage with the man himself. Be sure to stick around for Mac's front-flip stage dive towards the end. Coastal Frequencies is also presented in partnership with Become the Media and Prairie Coast Films. You can also contribute to Coastal Frequencies' Indiegogo campaign over here.